Coffee-flavoured desserts are in my top 5! 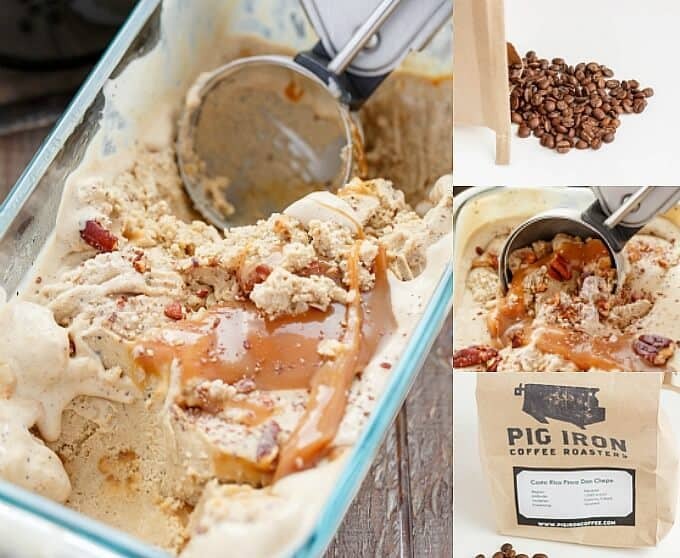 This Coffee Ice Cream with Toasted Pecans and a Caramel Swirl is a great way to use up whole beans AND cool you down this summer! The Cookie Writer was fortunate enough to receive a bag of Costa Rica Finca Don Chepe from Parachute Coffee. Provided below is my honest review and opinion of the product. 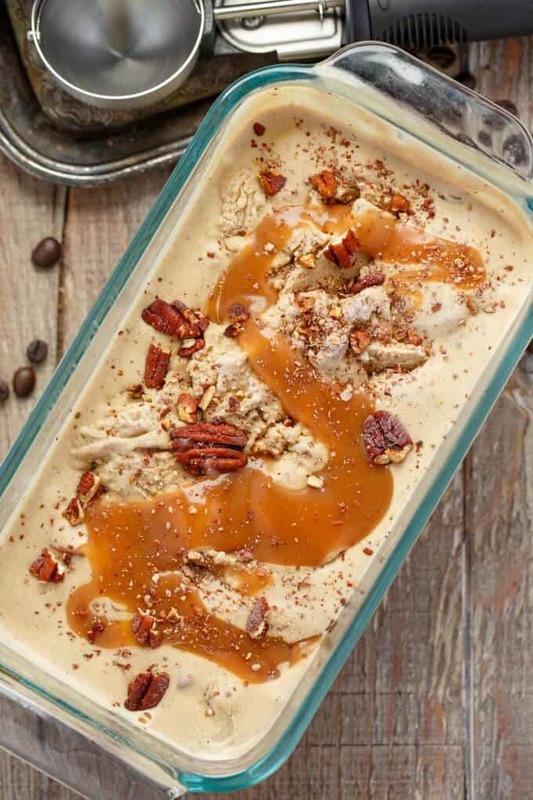 The photos and recipe for this Coffee Ice Cream with Toasted Pecans and a Caramel Swirl has been updated as of September 3rd, 2016! Dan is the huge coffee drinker in this household. Over the years, his “snobbery” has taken over and he has realized that making his own coffee at home, with freshly ground beans, is way more delicious (and fun!) than buying instant coffee. Even our almost three year old loves putting the beans in the coffee grinder. I, on the other hand, have always preferred coffee-flavoured desserts. The smell of coffee is intoxicating and it has slowly brought me into the habit of having a cup here and there with Dan. 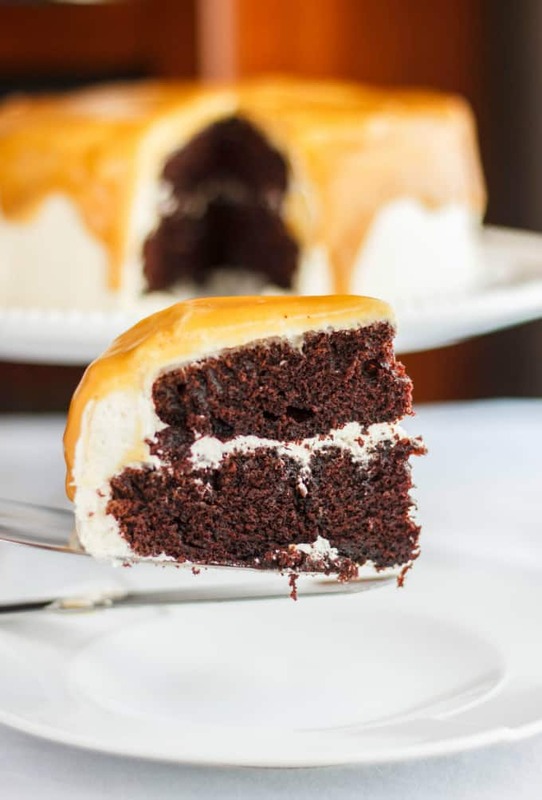 However, coffee desserts will always be my first choice and today’s recipe will not disappoint! This coffee ice cream is made with Parachute Coffee’s delivery of Finca Don Chepe roast and the flavour is beyond imaginable! It contains the blend of Oreos and dried raspberries… I know, I couldn’t believe it either but I love the two separately, so why not combined? Dan said it was my best ice cream flavour yet, and I am going to have to agree with him. Combined with toasted pecans and a caramel swirl, this coffee ice cream is everything a cup of coffee should be, but more! Rich, creamy, and decadent, but not too sweet. We were blown away with the initial tasting of this coffee, and the ice cream went way beyond our expectations. So why use freshly ground coffee beans over instant? There are infinite reasons, but take into consideration flavour, freshness, and quality. You could instantly (haha!) taste the difference using fresh coffee grounds, and the people at Parachute Coffee have really got their flavours down (thank you Mike and Jake!) We were so excited when the package arrived that we IMMEDIATELY made two cups of coffee (while enjoying the personal thank you card from the boys of Parachute Coffee.) The smell of the beans was to die for and I knew immediately with my first sip that I would be making a coffee ice cream (I love cream in my coffee so you see where I got the inspiration from.) Plus, you can take part of their monthly subscription delivery service for $25 a month, tax and shipping included, which includes a 12 ounce of coffee every month! How awesome would it be to wake up to a new coffee blend on your doorstep each month? Are you ready to begin this awesome journey of grinding your own beans and creating the perfect coffee ice cream?! Let’s do this! Get those coffee beans into the grinder. 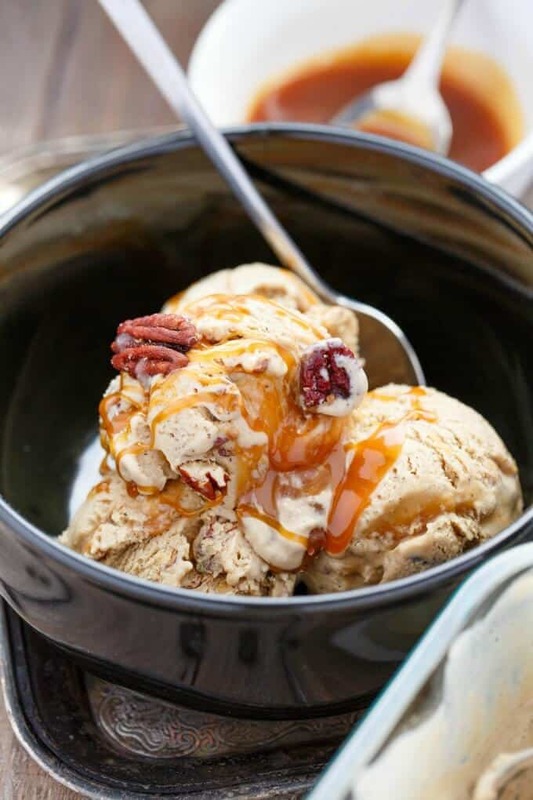 Coffee and caramel sauce pair together to make the perfect ice cream! Preheat oven to 350F. Place pecans onto a baking sheet and bake for about 7-10 minutes, making sure to keep an eye on them. Remove and set aside. In a medium-size saucepan, combine 1 cup of cream, milk, sugar, salt, and coffee grounds over medium heat. Heat until very hot, but do not let boil, stirring occasionally. While mixture is heating, whisk egg yolks in a large mixing bowl until paler in colour. Carefully and slowly pour the hot cream into the egg yolks, whisking constantly so the eggs do not scramble. Continue whisking until all the cream is blended. Pour mixture through a cheese cloth to remove coffee grounds (it is okay if some come through, but you want to get the bulk out. Return to pan with remaining cream. Heat until very hot again, stirring occasionally. Remove from heat and allow to cool to room temperature, stirring every so often. Cool in refrigerator overnight, covered. To make the ice cream, follow your machines instructions. When the ice cream is almost set (usually 20 minutes in my machine) add in the pecans and 1/4 cup caramel sauce. 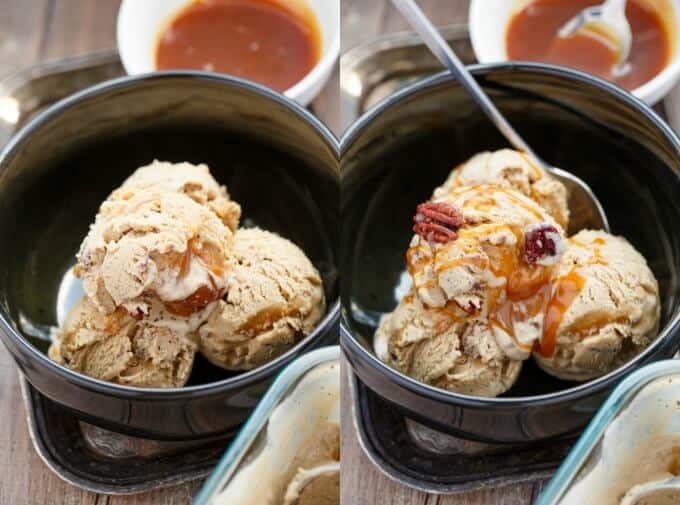 When the ice cream is finished churning, transfer to a freezer safe storage container, making sure to alternate between the remaining 1/4 cup caramel sauce and the ice cream to add more of a "swirl" effect. Note: Finish with extra caramel sauce and toasted pecans if desired. The experience with Parachute Coffee and their coffee of the month, Pig Iron’s Costa Rica Finca Don Chepe blend was wonderful. I am already preparing my second batch of coffee ice cream as we speak! 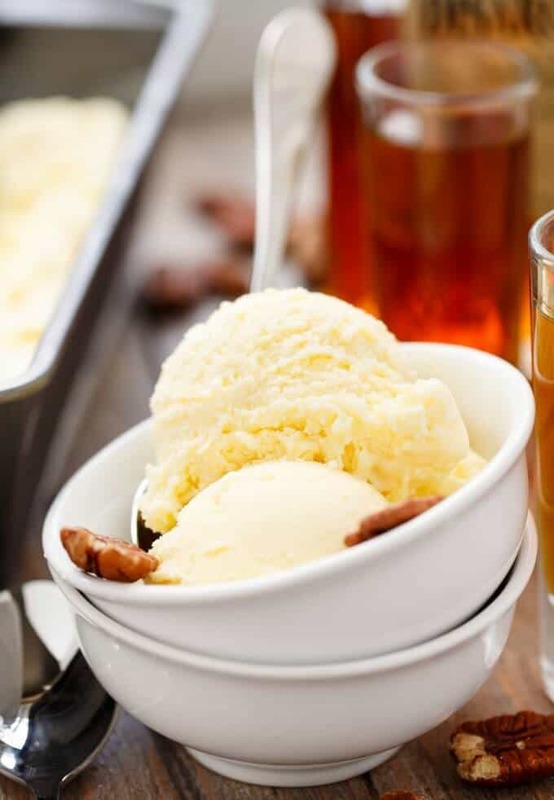 The coffee ice cream would be perfect on its own, so feel free to skip the caramel and pecans. But come on, who doesn’t like adding some goodies to their coffee?! Especially when it comes to these crazy frozen coffee concoctions that people are always coming up with. Rest assure though, even if you are not a crazy coffee lover, you will love this ice cream. Rich, creamy, with the perfect amount of coffee flavour. Coffee lovers may even say there isn’t enough coffee in it! If you want to heighten the flavours even more, work with 1/2 cup of ground coffee instead of 1/4 cup.